When originally published in America, the book “History of Man” was entitled “What to Audit.” Although our next book was never published under this title, it was designated as the corresponding “How to Audit.” That is how to audit the whole track incidents of a theta being as contained in “History of Man.” The book is “Scientology 8-80” containing the first explanation of the electronics of human thought and the discovery and increase of life energy in a being. Now, considering more than half of the book was originally hand-written you wouldn’t imagine you could mess it up that bad. Unfortunately, by the time it came to printing and publication, LRH had left Phoenix for England where he'd already begun work on the next level – “Scientology 8-8008,” but if you’ve ever wondered what may have crossed LRH’s research path to writing of the HCOB on “Alter-Is and Degraded Beings,” you can possibly track this guy down and get some fruitful answers. Then again, if you wonder who LRH is referring to in “Keeping Scientology Working” as regards, quote: “The not-too-bright have a bad point on the button Self-Importance,” this is definitely one of the characters! Now one up in describe who misplaced the chapter in “Advance Procedures and Axioms,” the transcription of the later chapters of 8-80 include such errors as the phrase “beam of sight” instead of “beam of light,” but don’t necessarily think it was an accident. The Auditor’s Code chapter was too short to his liking so he added the full two pages. Just for good measure, he also sprinkled a few clarifying paragraphs in the various chapters intermixed with LRH edits. Hey! Since he’s liking his work, why not just write a Forward. Don't sign it so it appears to be LRH and call it “What is Scientology,” no less. He did. Oh he also had some writing with his own byline, but after all his writings did have the word “Scientology” in the title, and the book also had “Scientology” in its title so why not make them the last chapter? He did. As for the original hand-written text that comprised “Scientology: 88.” Well, obviously the last chapter of that hand written book had to go for a reason only known to him, but no doubt out of one of those electronic implants on the whole track. And finally place the new chapters in the wrong sequence and Wuola! – the published “Scientology 8-80.” But other than what I’ve just mentioned, the book was in pretty good shape. Now, that guy was discovered to say the least. In fact, discovered 50 years ago. Indeed, he can now probably wear a badge as one of the first full fledged and fully declared “squirrels.” Yet, and you won’t believe it except for his self-blessed amendments virtually every one of his alter-is's remained to this day which doesn’t say much for editors at the time who were aware of all the data I've just given you but left it as is. Well, let’s just chock that omission up to one of the many reasons LRH wrote “Keeping Scientology Working” and the good news tonight is that those alterations have now been hammered so far out of existence, they are in another time warp. 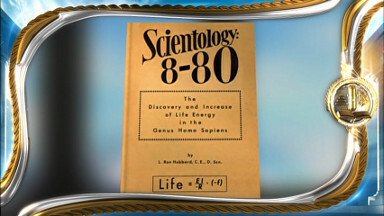 And, Scientology 8-80 is now LRH’s 8-80! Next, there are the lectures – “Source of Life Energy,” and even there we’ve recovered the correct technology. In fact, the lectures that comprise these series have been miss-dated and sprinkled amongst other series. Not anymore. Once again the series picks up after the book and in summary takes you right to the threshold of “Scientology 8-8008.” And yes – it too parallels the book as in “Energy Manifestations and Force” and “Flows,” as I just mentioned. And if I've given you the low-down on how messed up the previous 8-80 was, let's look at the result – a simplicity – because you can now read that book in one to three hours. The segment about Scientology 8-80 starts at 1:37:00 time marker of the video. Original EDITORIAL NOTE was fundamental to understanding who L. Ron Hubbard was. The original FORWARD was fundamental to understanding what Scientology was in general and how it related to the material in Scientology 8-80 specifically. Full text of the AUDITOR’S CODE was provided in the original edition – for obvious reasons. 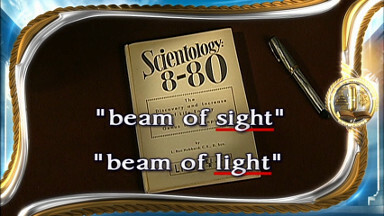 The section at the end of the book – THE APPOSITIONS OF SCIENTOLOGY – can be considered to be the first rendition of Dianetics and Scientology Technical Dictionary! All these sections were a fundamental part of the book – they should have never been eliminated! In a mind, any mind, the basic beingness is found to be a static on which motion can be recorded, and which, acting against motion, produces energy. A memory is a recording of the physical universe. It contains—any memory—a time index (when it happened) and a pattern of motion. As a lake reflects the trees and moving clouds, so does a memory reflect the physical universe. Sight, sound, pain, emotion, effort, conclusions, and many other things are recorded in this static for any given instant of observation. In a mind, any mind, the basic beingness is found to be a static which can create motion and on which motion can be recorded and which, acting against motion, produces energy. A memory is a recording of the physical universe. It contains, any memory, a time index (when it happened) and a pattern of motion. Like a lake reflects the trees and moving clouds, so does a memory reflect the physical universe. Sight, sound, pain, emotion, effort, conclusions and many other things are recorded in this static for any given instant of observation. One believes he can use any facsimile he has ever received. He has been hurt. He uses the facsimile of being hurt to hurt another. But since one survives as well as everything else survives, to hurt another is wrong. One regrets the injury, seeking to turn back time (which is regret). One believes he can use any facsimile he has ever received. He has been hurt. He uses the facsimile of being hurt to hurt another. But as one Survives as well as everything else survives, to hurt another is wrong. One regrets the injury, seeking to turn back time (which is regret). Thus even the laws of Newton can be found operative in thought. Fortunately all this is beyond the need of an auditor’s immediate grasp of the subject for if it were not, an auditor would have to be first a nuclear physicist before he could begin to make the lame well and the able more able. Some understanding of the matter is, however, desirable—otherwise some very weird philosophies would develop which would benefit none. Man has been ridden to death by philosophies which, unproven by any result, yet achieved enough prominence to spoil many a society (Schopenhauer or Nietzsche, for example). And many a scientific effort has fallen into disrepute because of philosophic misrepresentation. Thus even the laws of Newton can be found operative in thought. Fortunately, all this is beyond the need of an auditor’s immediate grasp of the subject. For if it were not, an auditor would have to be first a nuclear physicist before he could begin to make the lame well and the able more able. Some understanding of the matter is, however, desirable—otherwise some very weird philosophies will develop which will benefit none. And Man has been ridden to death by philosophies which, unproven by any result, yet achieved enough prominence to spoil many a society (Schopenhauer or Nietzsche for example). Thought can pervade an area or approximate a situation and know. The mind thinks with light facsimiles, or no facsimiles at all. Thought can pervade an area or approximate a situation and know. It thinks, the mind, with light facsimiles or no facsimiles at all. What wave most closely approximates theta? It would be one of nearly infinite smallness, and that wave is found to be aesthetic, the wave length of the arts. What wave most closely approximates theta? It would be one of nearly infinite length and that wave is found to be aesthetics, the wavelength of the arts. If we had to take the emotion, effort, and reason or mis-reason off the whole track, we would have along task. If we had to take the emotion, effort and reason or misreason off the whole track, we would have a long task. That which you see as beautiful of your free will gladdens you. Out of an obsessive aberration, all beauty becomes hideous even when the aberree cries out how lovely it is. Of your free will, that which you see as beautiful gladdens you. Out of an obsessive aberration, all beauty becomes hideous even when the aberree cries out how lovely it is. But what manner of incident is held by an aesthetic wave and how is it processed? It is so simple. But what manner of incident is held by an aesthetic wave and how processed? It is so simple. Neither you nor a preclear need accept “whole track” or the identity of the thetan as described fully in What to Audit*. Not to begin. You’ll very rapidly make up your own mind about it when you start the process “Black and White”. To audit an “assist”, a grief charge, an engram, see earlier works. These items are still with us. That “Black and White” solves engrams and locks wholesale does not mean single incident running is not effective and that it should not be known. But these and their techniques have no place here in “8-80”. Single incident processing, effort processing, the running of secondaries all are replaced by “Black and White”. Straight wire, lock scanning, valence shifting all are replaced by “concept processing”. The wide-open case, however, is processed on single incidents and concepts as necessary, for the wide-open case does not see white except in an actual electronic. The reason for this is that “Black and White” and “concept running” make clears, MEST and theta, in a very short time and they are so simple that one cannot mistake any of his moves. While an auditor can get complete results with them, they do not try his wits. *A History of Man by L. Ron Hubbard (original title What to Audit). Obtain from the bookstore of the Scientology Organization nearest you. Sec book list and organization addresses in back pages. To audit an “assist,” a grief charge, an engram, see earlier works. These items are still with us. That Black and White solves engrams and locks wholesale does not mean single incident running was not effective and that it should not be known. But these and their techniques have no place here in 8-80. The reason for this is that Black and White and Concept Running make Clears, MEST and Theta, in a very short time and they are so simple that one cannot mistake any of his moves. And while an auditor can get complete results with them, they do not try his wits. Concept processing and “Black and White” mean the goals of Scientology will be reached very soon. They mean that none in Scientology should be other than a MEST clear. As for “whole track” and thetans, I wouldn’t dare say a word if “Black and White” didn’t show them up with alarming velocity. A preclear can soar so in tone on “whole track” and “Black and White” that his capabilities so acquired cannot be ignored even by the bitterest foe of truth and freedom. As detailed in What to Audit, there are many electronic implants on the whole track. In other words, any preclear has, in the last few thousand years, been placed in an electronic field and rendered null, void and obsessed by heavy “electrical” currents. Concept Processing and Black and White mean the goals of Scientology will be reached very soon. And they mean that none in Scientology should be other than a Mest Clear. As for whole track and thetans, I wouldn’t say a word if Black and White didn’t show them up with alarming velocity. A preclear can soar so in tone on whole track and Black and White that his capabilities so acquired cannot be ignored even by the bitterest foes of truth and freedom. As detailed in Scientology: A History of Man, there are many electronic implants on the whole track. In other words, any preclear has, in the last few thousand years, been placed in an electronic field and rendered null, void and obsessed by very heavy “electrical” currents. A concept is a high wave thought, above perception or reason or single incidents. Thus as concepts are run, many incidents may tumble into view. A concept is a high-wave thought, above perception or reason or single incidents. Thus as concepts are run, many incidents made tumble into view. You can have a concept of anything, even a concept of confusion. The top and bottom points on the scales of the Chart of Attitudes (See Handbook for Preclears) make good concept material. You can have a concept of anything, even a concept of confusion. The top and bottom scales of the Chart of Attitudes make good concept material. You can run beauty and ugliness on parts of the body, on persons in the preclear’s past, and on the current and former bodies of the preclear. You can run Beauty and Ugliness on parts of the body, on people in the preclear’s past and on the current and former bodies of the preclear. If No. 2, as an engram, is in restimulation, the preclear will think he is at Position A behind himself, whereas he is frozen solidly by aberration into his own MEST body. If number 2, as an engram, is in restimulation, the preclear will think he is at position A behind himself, whereas he is solidly frozen by aberration into his own mest body. Here he will recover rapidly the sensation of his becoming nothing and the body everything. Here he will rapidly recover the sensation of his becoming nothing and the body everything. One holds one of these concepts and agrees and disagrees with it. He holds the concept and gets the flow on it by agreeing and disagreeing on the concept to subjects to keep them gray or white. One holds one of these concepts and agrees and disagrees with it. He holds the concept and gets the flow on it by agreeing and disagreeing on the concept of subjects to keep them gray or white. The characteristic of any vibration is that it contains the manifestations of a static and a kinetic. A static is something with no motion, no particle and no wave length; and a kinetic is something which has considerable motion. The interplay between the static and one or more kinetics causes energy interchanges. The characteristics of any vibration are that it contains the manifestations of a static and a kinetic. A static is something with no motion, no particle and no wavelength. And a kinetic is something which has considerable motion. The interplay between the static and one or more kinetics causes energy interchanges. A great deal of mechanical motion must be put into an electrical generator because an electrical generator is discharging between the dichotomy of effort and matter, a lower range dichotomy. In the higher ranges, the static is furnished by the individual, and the mathematical symbol for this near-ultimate is theta. A great deal of mechanical motion must be put into an electrical generator because an electrical generator is discharging between the dichotomy of effort and matter, a lower-ranged dichotomy. In the higher ranges, the static is furnished by the individual and the mathematical symbol for this near-ultimate is theta (0). The total components of one’s self-determinism is the ability to impose time and space. The total components of his self-determinism are the ability to impose time and space. The constant of light has been a sort of scientific ridge locking scientific thought. Within the spectrum of light itself there is a measurable difference of speed, and in the higher spectrum of reason and aesthetics, the speed of light is very fast. The speed of emotion, on the other hand, which is a gross wave, is evidently quite slow. One can conceive of an ultimate static which would be theta, and an ultimate motion which would be MEST. The interplay to create energy, however, can be much narrower. One has observed preclears try to run pleasure and find only pain. He has observed them run pain and find pleasure, but less often. The constant of light has been a sort of scientific ridge locking scientific thought. Within the spectrum of light itself, there is a measurable difference of speed. And in the higher spectrum of reason and aesthetics, the speed of light is very fast. On the other hand, the speed of emotion, which is a gross wave, is evidently quite slow. One can conceive of an ultimate static, which would be theta, and an ultimate motion, which would be mest. The interplay to create energy, however, can be much narrower. One has observed preclears try to run pleasure and find only pain. One has observed them run pain and find pleasure, but less often. Nuclear physics has been in its infancy and a great deal of pioneer work has been possible in the field. It should not be considered that nuclear physics has invaded the field of life, any more than the humanities have invaded the field of physics. Energy manifestations have a single applicable pattern. Nuclear physics has been in its infancy and a great deal of pioneer work has been possible in the field. It should not be considered that nuclear physics has invaded the field of life any more than the humanities have invaded the field of life. Energy manifestations have a single applicable pattern. The technique is simple, but it is most simple to an individual who has a thorough command of the entire subject. The rehabilitation of the thetan consists of his being able to sever communications with the body at will, and consists of making it possible for the thetan not to have a collapsed tractor every time the body is hurt, plus snapping him into the body. The technique is simple, but it is most simple to an individual who has a thorough command of the entire subject. The rehabilitation of the thetan consists of his being able to sever communications with the body, at will. And consists of making it possible for the thetan not to have a collapsed tractor every time the body is hurt, thus snapping him into the body.